Grab the MacHeist NanoBundle Free! One of the most popular Mac software resellers, Macheist, is known for their unique advertising strategies. Every now and then, Macheist offers deeply discounted bundles of the most popular software. 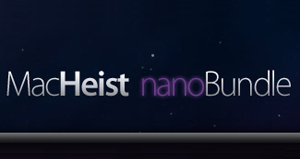 Their latest bundle, the MacHeist nanoBundle, includes 6 applications all being given away for free. Shovebox makes it easy to cram your information into one place for easy reminders and ultimate organization. Shovebox includes a menu bar icon that allows you to drag in text, images, links, files and more. You can then jot down notes on your content to remind you why it’s there and what you need to do with it. There is also a ShoveBox iPhone app that’s packaged with the same functionality. distraction-free space to write. Once you’ve finished your writing, exit the WriteRoom and your text is copied to TextEdit for easy copying/pasting into your blog or email. If you’re confused, don’t worry, I don’t get it either. Twitterrific is one of the most well known Twitter applications on the iPhone. This version is a very simple desktop Twitter client with a clean, black interface that’s easy to use. If you’re familiar with Twirl, you’ll find Twitterrific an easy substitute and possible long-term replacement. TinyGrab is an application that allows you to quickly share screenshots taken on your Mac. Pressing Command, Shift, and 4 brings up crosshairs to select the area you want to screenshot. TinyGrap will upload the screenshot and return a URL so you can automatically share your picture via email, twitter, or IM. Hordes of Orcs is an addicting tower defense game with a goal of protecting your village from invading orcs. There are numerous different towers with their own unique abilities that all help in attaining your goal of an orc-free village. Who wouldn’t want that? count reaches 500,000 bundles. Mariner Write is a word processor with a simple interface to easily create word documents. If you’re using the buggy Mac Office ’08, you’re going to want to spread the word as fast as possible. Normally $154, MacHeist is offering all of this software absolutely free. Head on over to MacHeist, register for the free bundle and help save everyone from the horrors of Mac Office.